MILAN -- Fiat said it completed the acquisition of shares in Chrysler Group it did not previously own, making the U.S. unit a wholly-owned subsidiary of the Italian carmaker. The company announced on Jan. 1 that it had struck a $4.35 billion deal to gain full control of Chrysler, ending more than a year of tense talks that had obstructed CEO Sergio Marchionne's efforts to combine the two automakers' resources. Fiat bought the remaining 41.46 percent stake in Chrysler from a retiree healthcare trust affiliated with the UAW. The trust, known as a voluntary employee beneficiary association or VEBA, has received $3.65 billion in cash for the stake, $1.9 billion of which came from Chrysler and $1.75 billion from Fiat. Chrysler has also committed to giving the UAW trust another $700 million in four equal annual installments, the first of which was paid in connection with the deal closure, Fiat said. Marchionne, 61, will remain as CEO through at least 2016 to pursue the merger of Fiat and Chrysler as part of a strategy to maintain earnings growth, Chairman John Elkann told journalists in Detroit on Jan. 13. Marchionne has estimated that Fiat and Chrysler together are the seventh-biggest carmaker worldwide. The two companies sold about 4.4 million vehicles combined last year, less than half the annual deliveries of Volkswagen AG, General Motors Co., and Toyota Motor Corp.
Fiat began accumulating Chrysler stock in mid-2009 as part of a U.S. and Canadian government-backed rescue of the U.S. automaker following the global recession. The Italian company’s stake increased to 58.5 percent, with the VEBA holding the remaining 41.5 percent. The two owners spent a year and a half in a dispute over how to value the trust’s stake, resolving the question in a deal reached in the closing days of 2013. Fiat’s board is set to meet Jan. 29 to lay out terms of merging the two carmakers, including the corporate organization and the location of its headquarters and main stock listing, Elkann said last week in Detroit. The combined company’s name will include Fiat and Chrysler. A three-year business plan will be presented in May. Marchionne said at the Jan. 13 briefing that the U.S. has a “large claim” as the headquarters site, and that he favors New York as the primary listing for the group, which would also be traded on a second stock exchange. The new entity is comprised of the Italian manufacturer’s mass-market Fiat and Lancia brands and its upscale Alfa Romeo, Maserati and Ferrari marques, along with the U.S. company’s Chrysler and Dodge volume units and SUV producer Jeep. Models brought out by the carmakers in the past year include the Alfa Romeo 4C sports car; the Jeep Cherokee, which went on the market two months ago; and Maserati’s Ghibli, the division’s first mid-sized sedan that’s pitched as an entry-level vehicle. Chrysler used the Detroit show to introduce a new version of its mid-sized 200 sedan. Fiat is planning to spend as much as 9 billion euros ($12 billion) to develop and assemble vehicles in Italy, people familiar with the project said late in 2013. The program would focus the Fiat line on variants of the trendy 500 subcompact and budget-oriented Panda small car while eliminating the compact Punto hatchback, and would create a convertible version of Alfa’s 4C, according to the people. 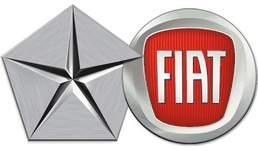 Marchionne said at the Detroit auto show that, once the Chrysler combination is complete, Fiat would be open to additional partnerships with other carmakers, such as PSA Peugeot Citroen and Suzuki Motor Corp. There’s less urgency in taking such a step now that the Italian-U.S. company has “the credentials to be at the table” with the other top global automakers, he said.